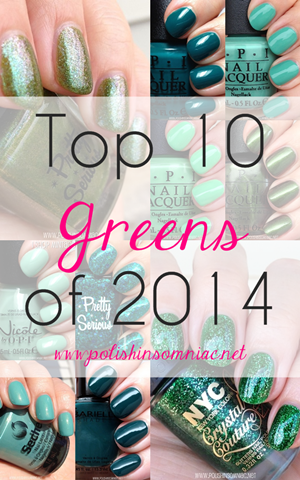 Today I have my first “best of” lists for 2014 – my Top 10 Glitter Nail Polishes! 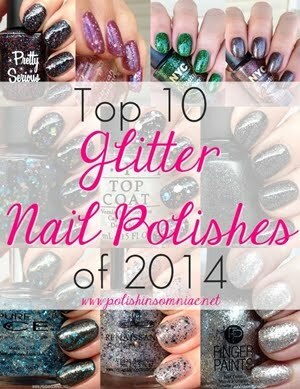 I’ve got a healthy mix of glitter “polishes” (that you wear on their own) and glitter “toppers” (that are meant to be layered). I’ve also got a few budget picks! Check them out and tell me what you think! FingerPaints Gilded Chrome was released as part of the limited edition Shredded Chromes collection. I love the dazzling mix of different sized silver glitters and the dash of gold! Renaissance Cosmetics Evenstar is technically from Winter 2013, but since I reviewed it in 2014, I’m just gonna go with it! There are only two left in stock as I’m writing this, hopefully it will be restocked again soon! Pretty Serious Daphne After Dark is just one of many fabulous glitters from the 2014 Rooftop Soirée Holiday Collection. I love how much color you can see through the black base! China Glaze Meet Me Under the Stars is another glitter polish with a black base that I just adore! The silver glitters really stands out against the black base. Wouldn’t this look awesome with a navy base? This polish is from the China Glaze Twinkle collection, which I have yet to post my review of… it’s coming! NYC New York Color Queen’s Jewels is a Crystal Couture Topcoat from the limited edition Queen’s Jewels Crystal collection. It is an amazingly pigmented green jelly with filled with green microglitter. This is two coats on it’s own, not layered over anything! I will definitely be pulling it out of my stash to wear this holiday season. I was tempted to list the entire lineup of Crystal Couture Topcoats from the Queen’s Jewels Collection on here, but I limited myself to just one more. NYC New York Color Rule the City was the only polish from the collection that didn’’t have a jelly base. It has is a gunmetal base with matching glitter so small that it’s barely a shimmer, but so densely packed that it only needed one coat. It also has pops of red microglitter that really makes it stand out! Pure Ice Winter Blues is a stunning glitter topper that you can pick up at Walmart for $1.99! 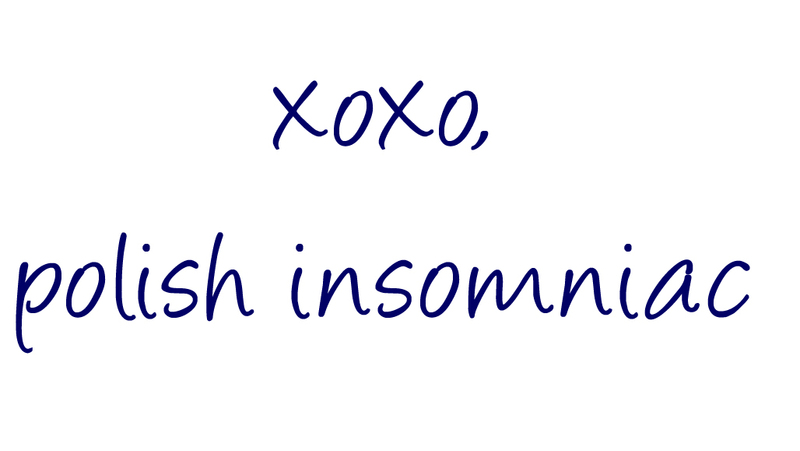 Here I layered it over a dark grey crème. (Check it out over blue in Amber’s Frozen Inspired Manicure.) I picked up both Winter Blues and Feelin’ Ornamental, which has the same base but green glitter! I think these are limited edition for Holiday 2014, so pick them up while you can! Deborah Lippmann Make Someone Happy is the glitter topcoat from the Recipe for Love Set. Here I have layered it over Let’s Stay Together. I just love the tiny blue shimmer mixed with the larger pink glitters! 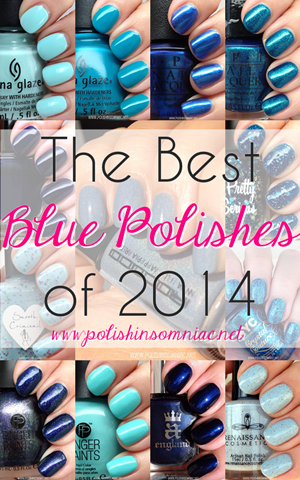 What’s your favorite glitter polish of 2014? 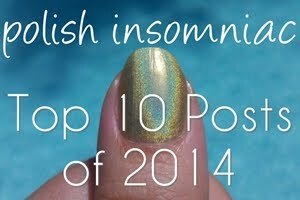 Let me know in the comments, and make sure to check out the rest of the Top 10 Lists below!